All Ball Colegrave plug trays have been carefully selected to give optimum performance of our varieties for your method of production. So whether you are fully automated or hand-transplant your plug plants, we have a tray format to perfectly fit your needs. For over 60 years, Ball Colegrave has been dedicated to providing professional bedding plant growers with the most innovative products and exceptional customer service to help them make the most of their business. From supplying imaginative, high-performing varieties to developing more efficient ways of growing, we are committed to making growers even more successful. The best availability even when you’re late! It’s not too late to choose from the largest inventory of vegetable, flower and perennial plugs and seed. This year is certainly looking to be a busy bedding season with Garden Centres reporting brisk trade. So why not check out our availability today and top up your order to ensure you optimise your full sales potential. 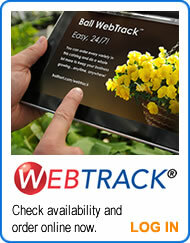 To see online availability, visit WebTrack.